This investment will expand the current plant's production capabilities and will feature significant new technology with applications in textiles and other industrial inks, including its industry-leading ElvaJetR inks product line. This is the latest in a planned series of investments to expand Sensient's global capabilities in sublimation and pigmented inks, along with pigment dispersions. Kenneth P. Manning, Chairman, President and CEO of Sensient Technologies Corporation, said, "With this investment, we are continuing to secure our leadership position not only in digital inks, but also in the global industrial ink market. We see a significant opportunity to grow our digital inks business and to meet the long-term needs of our customers. Our investments ensure that we will remain in the forefront of the industry with cutting-edge technologies and state-of-the-art facilities." . Morges, Switzerland,- Sensient Imaging Technologies S.A. confirms the suitability of BRO-9300 (black) and BRO-1120 (magenta), BRO-1140 (yellow) and BRO-1160 (cyan) for BrotherR LC-980/985 (Europe) and LC-71 (US) as well as LC-1240/1280 (Europe) and LC-75 (US). These ink-tanks are suitable for the most recent additions to the Brother Consumer inkjet lineup. The LC-980/985-cartridges are for the DCP-J125 , DCP-165C, DCP-195C, MFC-J220 , MFC-250C, DCP-145C, MFC-255CW, MFC-J265W , MFC-290C, MFC-295CN, DCP-J315W, DCP-375CW, DCP-365CN, MFC-J410, MFC-J415W, DCP-J515W. The LC-1240 / 1280 cartridges are for use in MFC-J280W, MFC-J430W, DCP-J525W, MFC-J625DW, DCP-J725DW, MFC-J825DW, DCP-J925DW, MFC-J5910DW, MFC-J6510DW, MFC-J6710DW, MFC-J6910DW. Following Brother'sR inkjet-philosophy, the new MFC-J280W, MFC-J430W, MFC-J625DW and MFC-J825DW use a permanent piezo print head and separate ink tanks. BrotherR has significantly increased the nozzle count on its print head. The head used in most previous BrotherR consumer inkjets had 94 nozzles per line and 4 lines for a total of 376 nozzles. The new print head has 210 nozzles per line and 4 lines for a total nozzle count of 840. The head jets a minimum droplet size of 3 picoliters for black and 1.5 picoliters for color providing print speeds of up to 35 ppm black and 27 ppm in color. While the optical density of Sensient's BRO-ink-series values are very similar to the original inks, the user of Sensient inks can expect an outstanding color gamut and a superior inter-color-bleed performance and the ink is dry when the paper is ejected from the printer. This year Sensient Imaging Technologies will mark again its presence at Remanexpo by demonstrating an extended range of ink jet inks and solution offerings for the aftermarket and the recycling industry. a new line of inks for Canon CL-511, CL-513 AND CLi-526-Series. a new line of inks for Brother LC-980/985 and 1240/1280 cartridges. SENSIMAILT line of inks for direct mail. SENSICODET line of inks for coding and packaging applications using HP45 cartridges or piezo printheads. Inks for large format printers. ELVAJETR TS-E 600 set of inks for T-shirt printers based on Epson technology. 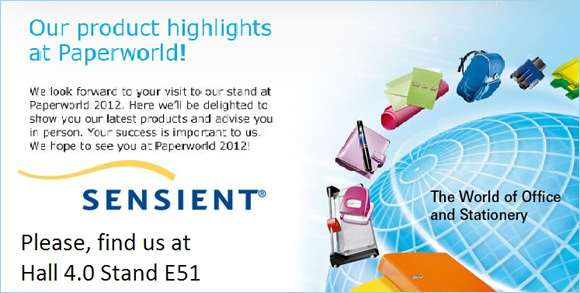 The major remanufacturers and refill shops in Europe who already trust Sensient for the quality and the performance of the inks will be offered new solutions to expand their own markets.